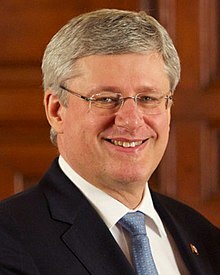 Stephen Joseph Harper (born Aprile 30, 1959), PC, MP, is the twenty-seicont prime meenister o Canadae an leader o the Conservative Pairty. Harper acame prime meenister when his pairty fairmed a minority govrenment efter the 2006 federal election. He is the first prime meenister frae the newly reconstitutit Conservative Pairty, follaein a merger o the Progressive Conservative an Canadian Alliance pairties. Harper is an evangelical Christian wi a pouer base in Alberta, home o Canadae's ile boom. Kent as an ally o Canadian fossil fuels, he haes promotit thair export tae the U.S. an Cheenae. He haes helped the federal govrenment tae dismantle some environmental restrictions on economic growth. Harper increased federal defense spendin bi nearly $1 billion annually in his first fower years in affice, wi mair projectit. Canadae haes amassed a federal debt ower $600 billion bi mid-2013. Harper haes been the Member o Parliament (MP) for the ridin o Calgary Soothwast in Alberta syne 2002. Earlier, frae 1993 tae 1997, he wis the MP for Calgary Wast. He wis ane o the foondin members o the Reform Pairty, but did nae seek re-election, an instead joined, an shortly thareefter led, the Naitional Citizens Coalition. In 2002, he succeedit Stockwell Day as leader o the Canadian Alliance (the successor tae the Reform Pairty) an returned tae parliament as Leader o the Opposeetion. In 2003, he reached an agreement wi Progressive Conservative leader Peter MacKay for the merger o their twa pairties tae fairm the Conservative Pairty o Canadae. He wis electit as the pairty's first non-interim leader in Mairch 2004. Harper's Conservative Pairty wan a stranger minority in the October 2008 federal election, shawing\ a smaa increase in the percentage o the popular vote an increased representation in the Canadian Hoose o Commons, wi 143 o 308 seats. The 40t Canadian Parliament wis dissolved in Mairch 2011, efter his govrenment failed a na-confidence vote on the issue o the Cabinet bein in contempt o parliament. In the Mey 2011 federal election, Harper's Conservative Pairty wan a majority govrenment, the first syne the 2000 federal election. His pairty wan 166 seats, an increase o 23 seats frae the October 2008 election. ↑ Prime Minister Stephen Harper. About.com – Canada online. Retrieved April 18, 2011. Wikimedia Commons haes media relatit tae Stephen Harper. This page wis last eeditit on 18 Februar 2016, at 16:58.